This is a comprehensive and easy to use lease for letting a workshop, barn or other self contained building of any size, for industrial, storage or mixed use. Features: guarantor provision; break provision; rent review options; options for assignment; no sub-letting; no management or service charge. This comprehensive lease is for letting a stand-alone workshop, factory, warehouse or light industrial unit which does not share services with any other unit. The building could be used for anything: from a car repair garage to a machining workshop to an aircraft hangar. This lease is not a compromise between the interests of the parties. It prefers the Landlords interest. We think that is the best start point. If you wish to make concessions to your tenant, that is fine, but we want you have those choices. If you are letting for more than three years, you will need to register your completed lease. The address of the office is below. The staff at the registration office are helpful and the process is simple. You can do that yourself too. 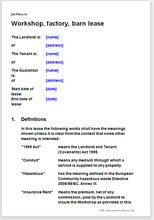 However, the tenant must have taken legal advice from a solicitor. That is no reason why you should pay a solicitor $5,000 too. However, if you are concerned, you can still take your Net Lawman lease to your solicitor for advice in any area that worries you. We do not claim to replace solicitors but merely to empower you to do what legal you can do personally. There is no provision for service charge recovery in this document. If you need this, perhaps because the unit shares services with others or is part of an industrial estate, see Business lease: unit on industrial park. If the property will be used as offices, Self contained office lease agreement may be more appropriate. If the property is mainly land, with plant or buildings, Business lease: land, either vacant or with plant or buildings may be more appropriate. This document has been drawn so as to make it applicable to the vast majority of leasing scenarios without making it difficult to edit. This workshop lease is comprehensive, providing alternative choices for important decisions.